The Chapmans are known for their support of adoption and their work to help Christian families be able to adopt. In recent times, they are also known for the sort of unthinkable tragedy no one wishes on anyone. On May 21st, 2008, their youngest son accidentally hit their youngest adopted daughter in the driveway and killed her. To have something like this happen is awful, but to have it happen when you are a family somewhat in evangelical Christian spotlight is pretty dreadful. I have often marveled at how well the Chapman's have dealt with this publicly...honestly and yet not without hope. It's a story I can't hear without weeping and so I can only imagine what it's like to live it. For all of these reasons, I was interested in reading Mary Beth Chapman's new book, Choosing to SEE. This book is not just about that fateful day, it's about her whole life and how she came to be the person she is. I'm always curious and interested in behind the scenes lives of public people and Mary Beth is extremely honest as she shares her struggles with depression, control, etc. The Chapman's lives were never easy going but they tried to live by faith and with love. Mary Beth doesn't paint things over to seem rosy or glowing, she's pretty candid about how much she resented her life at times. That makes me appreciate the story, as does the profound positive effect adoption had for them all. The first half of the book is her life before Maria's death and the second half is how worked through their grief and sought healing. The writing is quite straightforward, it gets the job done, but there isn't anything particularly beautiful about it. Even so, for anyone with an interest in this family or how people deal with horrific tragedy in their lives, the book is a good one. 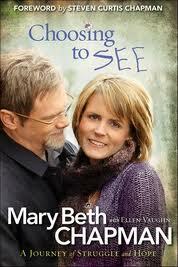 Choosing to SEE is available from Revell Books a division of Baker Books in bookstores everywhere.